Not using any pattern-, PIN- or password-lock is a huge security problem, but reentering your PIN a hundred times a day can also be annoying. ‘Delayed Lock’ is a solution to this problem: After unlocking your phone, it will turn the lock screen off for a user defined amount of time. You can turn your phone off and on as often as you want without entering your password/PIN/pattern again. 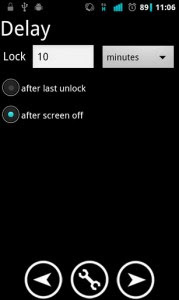 After a certain time, it will automatically reactivate your lockscreen, so no stranger can access your personal data. 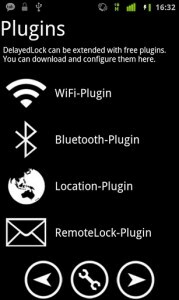 Additionally, there is also a notification in the Android status bar and a widget to immediately reenable the lock screen, and free plugins to automatically disable the lock when connected to a specific WiFi network / Bluetooth device or at certain locations. Free trial version is available to test the app with your phone (search for ‘Delayed Lock Trial’). PLEASE TEST IT BEFORE BUYING!